Oubliez les réservations dans le restaurant chaud du jour à New York. Ne faites pas la queue dans un restaurant populaire non plus. Au lieu de cela, offrez-vous un délicieux déjeuner pendant cette croisière de deux heures sur un bateau tout en verre autour de New York, qui vous offrira un aperçu de près de la Statue de la Liberté. En tant que pianiste, vous écoutez de la musique relaxante, admirez l’immense vue sur l’une des plus grandes villes du monde et savourez un délicieux déjeuner préparé par le chef exécutif à bord. 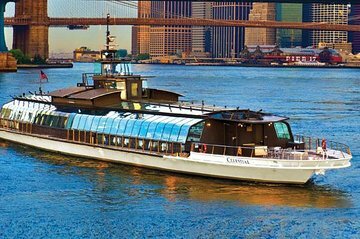 Rendez-vous à Chelsea Piers à midi et arrêtez-vous ensuite sur les Bateaux New York pour commencer cette relaxante croisière de deux heures. Promenez-vous dans la conception tout en verre du bateau, offrant le nec plus ultra en matière de tourisme, y compris une vue à 180 degrés de New York. Et puis dirigez-vous vers votre table. Pendant que le bateau navigue sur la rivière Hudson, notez certains des points de repère que vous dépassez: du musée d'art américain Whitney conçu par Renzo Piano au One World Trade Center à la Statue de la Liberté. Finalement, lorsque le bateau se tournera vers l'East River, vous aurez une vue magnifique sur le pont de Brooklyn et le pont de Manhattan. Profitez de l'ambiance du bateau alors qu'il navigue dans New York. Écoutez le pianiste jouer différents styles de musique, y compris le jazz et le blues. la manière la plus sophistiquée et spéciale de voir le meilleur de New York de l’eau. C'est un Moment exceptionnel passé avec ma femme est mes filles lors de notre séjour. Je le recommande sans hésiter une seconde. Nous avions réservé le midi, le beau temps était au rdv, le bateau ne tangue pas et le repas était très bien. After a stressful first day in New York due to Viator's awful service with another booking, me and my daughter were really looking forward to this trip. We arrived an hour before we were due to set sail and went to check in, the ladies at the booking office said that they had no record of our booking with Viator being transferred to them, despite us booking this trip back in October 2017. They told us that they had no room to accommodate us. I told them that we could not do the trip another day due to our tight schedule, we were then told that they could fit us on however continually made the point that they were full. We were squeezed into a corner of the boat and completely ignored for most of the time due to the limited staff on board. We felt like an inconvenience. The whole experience was completely overshadowed by yet more stress caused by Viator. Would not recommend due to such a negative experience with Viator and their poor communication with the organisers of the boat trip, AVOID! This tour was recommended from Eric's New York app and he was spot on. It was a delightful 2 hours. The tour went from Chelsea Pier up to the Brooklyn Bridge then back via the Statue of Liberty and very close it was too. Very rousing music was played at the time which was not only appropriate but also made me quite emotional. We were met by a line of waiters to greet us. They all had a name badge and where they were from and they were all excellent. The food was delicious. A talented pianist and singer played requests and also gave us information of what we were passing by. There is an extensive drinks menu - my 2 bellinis were very good. The boat has windows to the ceiling so whether sitting by the window or further in, the views were good and there was a viewing place outside of the boat for taking photos, although, on the day we went it was freezing! There is also an evening cruise with the same boat. All in all, a trip worth taking. It returns to Chelsea Pier which is then convenient for the Highline which is probably a better walk in the summer with the plants in full bloom. This was a most enjoyable experience. The boat was very stable in the water, the meal was excellent and cooked aboard the boat, and the service was wonderful. Although the sky was overcast and the wind blew constantly, we were still able to get great views and pictures of the lower Manhattan skyline and the Statue of Liberty. I would highly recommend this event. This is a must do. Beautiful setting good food and great views of New York by night. Great service nothing too much bother. Fantastic views of The Statue of Liberty, This trip on the River takes in nearly everything you want to see in New York but in a relaxing setting all to music which was also very good. Can't say anything negative about this you will love it. It was my husband 60th birthday and a treat for him he was in awe of the whole trip. Lovely, we had a great time, the food and the service was excellent. The food was tasty and the running commentary was necessary when it could be heard over the din. Unfortunately, I was under the impression that we would circle Manhattan. However, good trip.